Rules of thumb are easily learned and easily applied approximations or procedures to calculate or estimate some value. Here we look at rules of thumb useful for climate change and coastal recession. In coastal management, perhaps the best-known rule of thumb is the Bruun Rule. This provides a rate of shoreline recession under sea-level rise for sandy (unconsolidated) shores. It should be used with caution at the scales at which coastal managers often work, i.e. a single beach, because of the underlying assumptions and simplifications. Rules of thumb are easily learned and easily applied approximations or procedures to calculate or estimate some value. They can also be called heuristics. A good rule of thumb should be robust (work reasonably well over many conditions) and helpful (it should advance decision-making rapidly). The purpose of using a rule of thumb is to make a quick assessment of whether closer analysis is needed. A good rule of thumb will, for example, enable a council to make a first-pass assessment of all its beaches to quickly narrow down which ones are most at risk. However, rules of thumb cannot provide all the answers—following the first-pass assessment, the ‘at-risk’ beaches will need a closer inspection using a more rigorous method of analysis. How to conduct a climate change risk assessment looks in detail at the different levels of risk assessment in climate adaptation planning. Global climate has warmed by about 0.85oC since pre-industrial times (see Observed climate and sea-level change). Global climate can be expected to warm by as much as 4.8oC over the 21st century. Current pledges to reduce emissions by governments, if realised, would reduce this figure to 2.7oC. The level of warming thought to lead to dangerous climate change is 2oC over pre-industrial levels (1.3oC during the current century) (see Global climate change). Rainfall intensity may be expected to increase by 5% per degree Celsius of global warming. This has been proposed by Engineers Australia (2014) as a rule of thumb until more detailed information becomes available (see Section 6.3 of Information Manual 3: Available datasets). Sea-level rise. In adaptation in Australia, the value of 0.8 m sea-level rise by 2100 as a planning benchmark is rapidly assuming the status of a rule of thumb (see Climate change in Australia). As a guide to open coast sea-level rise, it is a useful approximation, since sea-level rise does not vary by a large amount around Australia’s coast, and is broadly the same as global sea-level rise. However, this rule of thumb does not take into account storm surge, wave height, or modifications in estuaries and enclosed bays. It is therefore more of a starting point, from which more complex calculations can be made to understand what is likely to happen at the local scale. Wave setup. Wave setup and runup levels relate to wave action on the shoreline (see Figure 1). Wave setup refers to the increase in the mean water level towards the shoreline caused by wave action, and wave runup is the rush of water up a beach after a wave reaches the shoreline. Wave setup level is the most representative inundation level for areas located away from the shoreline. There are limited observations available and, in their absence, wave setup is often defined as proportional to wave height. As a general rule of thumb, wave setup is taken to be around 15% of the offshore significant wave height as measured by wave buoys (Masselink and Hughes 2003). More information is provided in Section 3.3 of Information Manual 3: Available datasets. The Bruun Rule. In coastal management, perhaps the best known rule of thumb is the Bruun Rule. This provides a rate of shoreline recession under sea-level rise on sandy (unconsolidated) shores. One of the great strengths of the Bruun Rule is that it provides a clear explanation for why the risks from sea-level rise are not simply the direct effects of inundation, but also takes account of the accompanying erosion and shoreward recession of the coast. 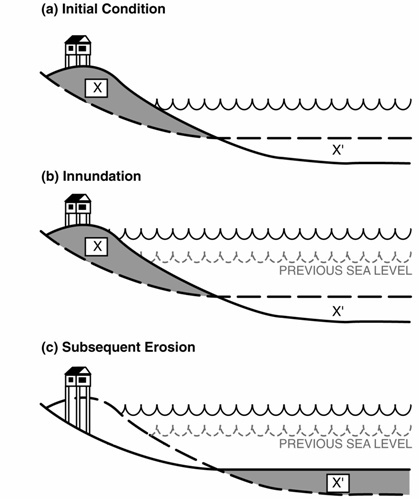 As shown in Figure 2, rising sea levels directly inundate only a small portion of the beach (b). However, the cross section of any beach tends to follow its own profile relative to the sea, conditioned by factors such as grain size of the beach material and seasonal variations in storminess. As sea level rises, the nearshore bottom must rise as well to maintain that profile. Unless sand is brought in from elsewhere (beach nourishment), the beach and dunes will provide the material (sand and soil) that elevates the bottom, through erosion (c). As an approximate rule of thumb, a 1 cm rise in sea level will lead to a 1 m retreat of the coastline. For purposes of precise estimation of the rates of shoreward recession at a single beach (the scale at which coastal managers often work), use of the Bruun Rule is not always appropriate. Its approach is two-dimensional – it does not allow for longshore sediment movement. It assumes no change in wave climate, and that there is a depth beyond which there is no transfer of sediment between the nearshore and offshore. These assumptions will in many real-world cases be unrealistic, and caution needs to be exercised in considering whether application of the Bruun Rule will provide a realistic solution. Three-dimensional models are available that take into account more processes, such as longshore sediment movement, but these are of course more complex to use. The NSW Government (2010) recommends that, where the Bruun Rule is to be applied, surveys are carried out to accurately determine the input parameters. For further information on the Bruun Rule and its application, see Section 4.1 of Information Manual 2: Understanding sea-level rise and Section 6.4.3 of Information Manual 3: Available Datasets. Figure 1: Components of storm tide and breaking wave processes. Source: DSE 2012, © The State of Victoria Department of Sustainability and Environment 2012. Figure 2: How the Brunn Rule works. A one-meter rise in sea level implies that the offshore bottom must also rise one metre in order to maintain the cross-shore beach profile. The material to raise the offshore bottom may come from shoreline erosion in the absence of beach nourishment. Source: Titus et al. 1986, reprinted by permission Taylor & Francis LLC, (http://www.tandfonline.com). The mean wave height (trough to crest) of the highest third of the waves. DSE, 2012: Victorian Coastal Hazard Guide. Victorian Government Department of Sustainability and Environment Melbourne. Accessed 17 May 2016. [Available online at http://www.vcc.vic.gov.au/assets/media/files/Victorian-Coastal-Hazard-Guide.pdf]. Engineers Australia, 2014: Discussion Paper on an Interim Guideline for Considering Climate Change in Rainfall and Runoff 24 November 2014. ARR Discussion Paper Number ARRD3. Accessed 17 May 2016. [Available online at http://arr.ga.gov.au/__data/assets/pdf_file/0011/40412/Draft_ARR_interim_guidance_Format.pdf]. Masselink, G. and M.G. Hughes, 2003: Introduction to Coastal Processes & Geomorphology, Arnold, London. NSW Government, 2010: Section 4.3 Recession of unconsolidated shorelines. In: Coastal Risk Management Guide: Incorporating Sea Level Rise Benchmarks in Coastal Risk Assessments. State of NSW and Department of Environment, Climate Change and Water NSW, Sydney, 5-6. Accessed 17 May 2016. [Available online at http://www.environment.nsw.gov.au/resources/water/coasts/10760CoastRiskManGde.pdf]. Titus, J.G., 1986: Greenhouse effect, sea level rise, and coastal zone management. Coastal Zone Management, 14(3), 147-171.